The best Pad Thai recipe with shrimp. This homemade Pad Thai noodles dish is authentic, delicious and healthier than Thai restaurants. 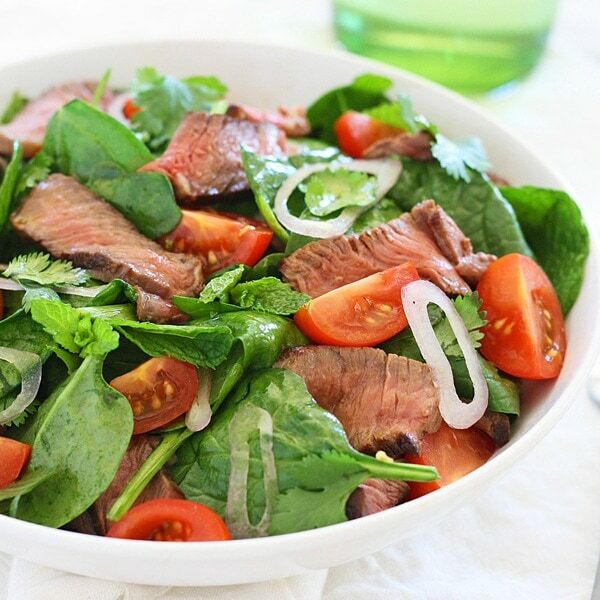 Skip takeout and make it for dinner tonight! Shrimp Pad Thai – easiest and best Pad Thai recipe with shrimp. This homemade Thai fried noodle is better and healthier than takeout. Pad Thai is a popular Thai stir-fried rice noodles dish with vegetables with a sweet and savory sauce and topped with crushed peanuts. You can make Pad Thai at home with chicken, shrimp, or a combination of chicken and shrimp. I love shrimp Pad Thai the best. I had the best shrimp Pad Thai at Bangkok’s international airport many years ago. I was on a transit and had a quick meal at the airport terminal. I ordered a serving of shrimp Pad Thai from a fast-food joint. Hot off the wok, my fried noodle was absolutely delicious, fresh, with the perfect balance of flavors. It was a tad spicy, savory, sweet and sour. I was instantly hooked. Since then, Pad Thai has become a staple whenever I dine out at Thai restaurants. Somehow the ones I have tried here in the US pales in comparison. This is my shrimp Pad Thai recipe. 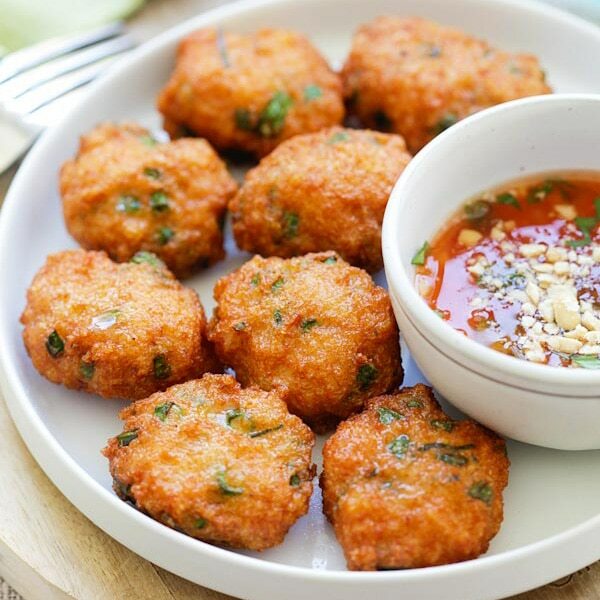 Try it, it’s healthier and better than your regular Thai takeout. Cook the skinny rice sticks according to the package directions. Strain in a colander and run cold running water until the noodles becomes cool. Set aside to drain. Make the Tamarind juice by adding the tamarind and water together. Use your hand or a spoon to massage and squeeze the tamarind pulps to release the flavor. The tamarind juice should be dark brown in color, and slightly thick in its consistency. Extract 4 tablespoons of juice, set aside. Discard the tamarind pulps. Heat the oil in a wok or skillet over high heat. Add the garlic and stir fry until aromatic. Add the shrimp, tofu, and continue stirring. As soon as the shrimp changes color, add the rice sticks and stir continuously, for 30 seconds. Use the spatula to push all the ingredients to one side of the wok or skillet. Add the eggs and let cook for about 1 minute or until the bottom sets. Fold the noodles over the eggs, and then add in the Sauce. Stir continuously until everything is well combined. Add the bean sprouts, chives and do a few quick stirs. Turn off the heat and serve the noodles immediately with the lime wedges and topped with the peanuts. All photos and recipes on Rasa Malaysia are copyright protected. Please do not use the photos and recipes without prior written permission. 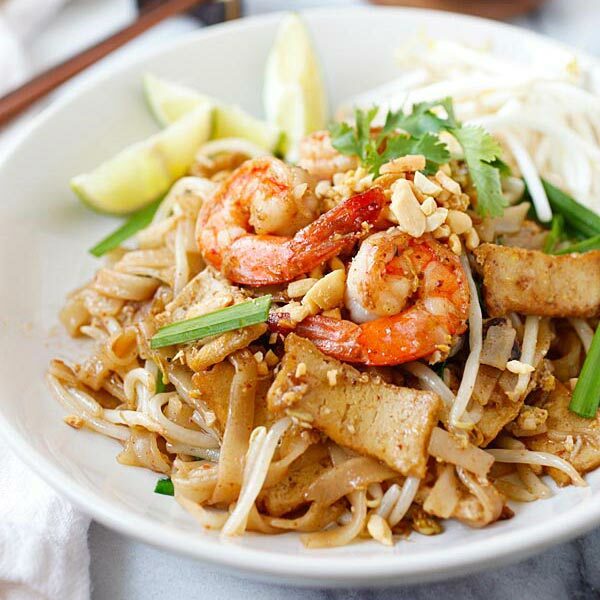 If you wish to republish this recipe, please rewrite the recipe in your own words instead of copy and paste and link back to http://rasamalaysia.com/shrimp-pad-thai-recipe/. Thank you very much! I have to try this one. I have it out at restaurants every now and then but I’ve never tried to make it. Thanks for the recipe!! sorry i want to know thing . do we can used egg noodles with pad thai or only used rice noodles ?? It should be rice noodles for the pad thai. This looks extremely delicious…Thank you for sharing. Any substitute for tamarind Juice? You can use rice vinegar. This was awesome! I had never made pad Thai from scratch and this turned out fantastic. I live outside NYC and had a very hard time finding tamarind so google turned up a good recipe as a substitute using tomato paste, rice vinegar, worstechire, sugar and water and it worked well. I will order tamarind from amazon before I make this again but thank you for such a great recipe- the whole family loved it!